Our Book Club is currently closed to new subscribers. We encourage you to join our Membership Circle instead! Members have access to four book-based lessons each year with exclusive downloads to DGT™ created materials, plus these members enjoy big hearted, thought provoking lessons and acts of kindness. Plus, there's a members-only forum and access to personalized advice from DGT experts. Our unique, quarterly book club teaches kindness and promotes family togetherness all year long! 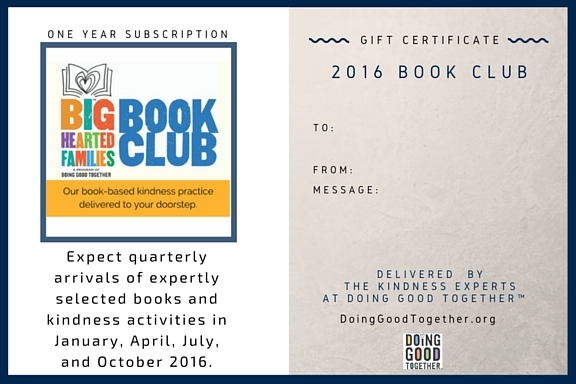 The Big-Hearted Families™ Book Club from Doing Good Together™ is ideal for children ages 4-10 and their parents, grandparents, or caregivers who want to engage with youngsters in thoughtful ways. Companion book suggestions for older readers. We deliver books plus kindness lessons! Imagine opening the mailbox to find a special package with your child's name on it! Families will enjoy great stories and seasonal kindness ideas every quarter! Customized clip & store conversation cards make big-hearted discussions easier. Every Book Club arrival includes a kindness activity customized to the book's theme! Plus... we offer other kindness ideas via our 3-month Kindness Challenge every season. Choose a one month trial or an entire year of quarterly deliveries. Shipping is free and gift wrapping is available. Makes a great "experience gift" for nieces, nephews, or grandchildren! PDF Gift Certificates can be emailed to you, or we can print one and include with first book shipped. When choosing Gift Certificate option, please specify Standard, Winter, or Christmas theme. Order anytime... emailed announcements or gift-giving certificates available! Want to add more kindness to your calendar? Subscribers to our Book Club qualify for a reduced rate to our Membership Circle! Just $19.95/year. Check out some of our previous Book Club titles!